… and take back your town! Editor’s Note – This is Part II of the five-part Real Estate Lead Generation Special Report a.k.a. the Local Zillow. In 2005 Rich Barton and Lloyd Frink, (two former Microsoft execs and the founders of Expedia, one of the most successful online travel sites), started a little online real estate data company called Zillow. Today that company is a publically traded company worth over $4 Billion. Their basic business premise was to create a media company that sold advertising products to the real estate industry. In order to sell those advertising products Zillow needed to generate traffic from people interested in buying and selling real estate in the United States. Initially Zillow acquired their data from public sources like the County Assessor and Treasury offices. The data was (and still is) publically available to anyone and could be either scraped, downloaded or purchased on demand. As Zillow grew it started acquiring data directly from real estate brokers and regional MLSs through either direct links or third party data aggregators like List Hub. It struck up marketing partnerships with the likes of Yahoo and the nations largest newspapers. It created engineering solutions to manage, enhance and analyze its real estate data and create products that helped agents and consumers buy and sell homes. And where it didn’t create a proprietary engineering solution it acquired complimentary real estate tools and services that improved the user experience on the Zillow website. And then, a decade later, once it was already the most popular real estate website in the world, it bought out it’s biggest competitor (Trulia) and became the Zillow Group. It did this by creating a superior user experience for visitors to its website and by understanding that people are interested in all real estate, not just the 3% of homes for sale. That’s why Zillow has a database of 130,000,000 homes and not just the 3,000,000 homes that are active or for sale. I’m highlighting this point because it’s critical to developing a marketing strategy for sellers and not just buyers. Not bad for a ten year old company! But Zillow had relatively humble beginnings. It started out by collecting, aggregating, enhancing and publishing public real estate records – the exact same public records that you can access online right now. That’s right – you can go online right now and pull down your entire local real estate database – usually for free or a small fee and usually in a digital format (like an excel spreadsheet). It wasn’t this easy when Zillow started in in 2005. Back in 2005 very few local government offices allowed you to go onto their website and download their public data in digital format. That’s because most local government offices either didn’t have their data in digital format or didn’t make the data available to the Public in digital format. Sure you could walk into your local Assessor’s office and search public records, like the real estate database or real estate tax roll, but it was difficult to get a digital copy of the entire database. And even if you could get a copy of the database it usually came with a hefty price tag. The bottom line was that it was a combination of impossible or difficult or expensive to get a digital real estate database from your local government office. Zillow’s advantage was that it had considerable cash and engineering resources and it used those resources to eventually aggregate and collect just about every piece of public real estate data. Now flash forward to 2016! Now it’s much easier to get your hands on a free digital copy of your local real estate database. It varies from State to State and County to County but most towns have a digital database and the database is available for download for free or for a reasonable fee. Let’s take my County as an example. I live in Boulder County, Colorado. I’m able to go to the Boulder County Assessor’s website and download a free copy of the entire real estate roll for Boulder County. It’s free, it’s online and it’s in an editable Excel spreadsheet. And there’s a wealth of powerful data – Physical Address, Mailing Address, Tax and Owner details. That means I can download a copy of every home matched to every homeowner in my town. It also includes a mailing list so I can send direct mail to either the street address or the homeowner’s alternate mailing address. Do you understand how powerful this is for your business? Not only do you have an inventory list of every home in your area but you also have the owner’s details and their mailing address. This list is the single most important list in your real estate business because it is a highly targeted list of homebuyers and sellers a.k.a. your clients. It is the solution to the biggest problem you have growing your real estate business – the lack of a pipeline of qualified and affordable buyer and seller leads. And it’s just a click away on your County or Town website. 10 years ago Zillow understood the power of this real estate list and found a way to systematically collect, maintain and publish local real estate data. Then they turned your free local public real estate data into a $4 Billion real estate powerhouse. And … [insert dramatic pause here] … you can do the same! Probably not the $4 Billion part but you can create your own Local or Little Zillow by building your own local real estate database and using it to dominate local online real estate traffic. You have access to the same fundamental real estate data that Zillow used to build its business. In fact Zillow actually did most of the legwork for you by getting local authorities to commit to creating digital databases. Now you can go to your local Assessor’s office and easily create your own local real estate portal with information about every single home, for sale or off market, in your local area. – As Realtors we’re in the real estate business and homes are our inventory. – Shouldn’t we know everything there is to know about every home in our local area? At it’s most basic level isn’t our core business really just about introducing real estate inventory to real estate clients? Our inventory is every real estate parcel and our customers are every real estate buyer, seller, landlord and tenant. The basic information tends to stay the same – address, size, beds and baths – so once you create your database you have a solid foundation to understand your inventory and build your real estate business. Important Note – I’m not talking about creating a database with hundreds of data fields for every home. That type of data is already available on your local MLS. I’m talking about creating a database with around 15 data fields per home – things like owner, address, lot size, home size, beds, baths and value. The real value will come when you add your personal local knowledge and expertise to the basic data set. Zillow Group, Inc. operates the leading real estate and home-related information marketplaces on mobile and the Web, with a complementary portfolio of brands and products to help people find vital information about homes and connect with local professionals. Zillow Group’s brands focus on all stages of the home lifecycle: renting, buying, selling, financing and home improvement. The Zillow Group portfolio of consumer brands includes real estate and rental marketplaces Zillow, Trulia, StreetEasy and HotPads. In addition, Zillow Group works with tens of thousands of real estate agents, lenders and rental professionals, helping maximize business opportunities and connect to millions of consumers. We also own and operate a number of brands for real estate, rental and mortgage professionals, including Postlets, Mortech, Diverse Solutions, Market Leader and Retsly. Do you see that Zillow isn’t just a real estate search company? It wants to be a complete real estate portal that covers every part of the real estate transaction. That’s your area of expertise and how you earn a living. Here’s how you protect it! I’m going to call this idea the Little Zillow or Local Zillow Idea. Zillow will hate that name because they’re so uptight about the Zillow name and protecting their trademark. So even though I’m calling it the Little Zillow as a way to explain the idea, we can’t publically use their name or trademark. So don’t do something stupid like get a domain like LocalZillow.com etc. or use the Zillow name in any way. In fact, I know they’re going to hate it so much that from this point on I may not call it the “Little Zillow” idea but rather the Little Z idea. Build a real estate portal for your local area and publish details about every home, not just homes for sale, in your local area. Then create a database that maps every home to a homeowner together with their contact details. This will allow you to identify every piece of real estate, every homeowner and will give you a mechanism to immediately contact every homeowner. That’s what you need to do to build your own local version of Zillow or your own local Little Z. If you have the right tools and know what to do you do it in as little as 30 days or take if you don’t know what to do you can chip away at it for a year. Either way, it can be done and it will be worth every minute of your time. The real estate industry has always been about the data … and who controls the data. As real estate brokers we’ve always been the gatekeepers to real estate data through our membership in our local MLS. It’s our data but the MLS strictly controls how we use the data and particularly how we share the data. There are very strict rules and penalties governing things like IDX and “non-public” data. If you don’t believe me then start publishing sold or historic data from the MLS on your website and see how soon you get a cease and desist letter from your MLS. Then along came Zillow and blew open the doors so the public can now access a huge amount of data directly from one website at the click of a button. Now I’m not saying that their data is as deep or detailed as the MLS data but it’s more than enough to satisfy the needs of a home buyer or seller surfing the internet for info about the real estate market and homes for sale. The point is that Zillow understood the value of the data and went about systematically collecting and aggregating it into a national public database of over 130,000,000 real estate parcels. And you can do the same (for your local area). First, create a database of every home in your local area. You can usually get this database from your local County Assessor office. Second, make sure you add the homeowners name to the database. Most County databases include the homeowners’ details. Third, add each homeowner’s contact details to the database. The contact details that you need are the street address, mailing address, email address and cell phone number. You should already have the street address so this makes it easy (but expensive) to send a direct mail campaign to each homeowner. The County usually gives you the homeowner’s mailing address. The email address and cell phone number is a whole different story. The reason you need them is to make it easier and cheaper to electronically market to your prospects rather than use expensive snail mail. This is normally the tricky part and will require a prolonged marketing campaign to get homeowners to opt into giving you their contact details and consent to receive communications from you. Fourth, publish a website (aka real estate portal) with a page containing the public data for every single home, subdivision and neighborhood in your town. Don’t publish any private data like their contact details. That’s your proprietary currency for building a thriving real estate business. Fifth, publish a members only back end to your website that is restricted to local residents and requires registration and membership. Review data and licensing terms of service. The key thing about your database is that it doesn’t need to be perfect from day 1. All you need is the basic property information, like the street address, and you can launch your portal. Then, over a period of time, you can enhance and update your database. Call it a labor of love and build it over a year. Do it properly and it will provide you with a return on investment for the rest of your real estate career. In fact, I can suggest a number of marketing initiatives that you can use to promote and grow your database at the same time. The real value to your database will be your proprietary local knowledge and expertise. Most Realtors only cater to a small percentage of the market that is actively buying and selling homes right now. At any given time around 3% of the total number of homes in a local area are for sale. That’s around 300 homes in a market of around 10,000 homes. In a market of 10,000 homes you probably have around 100 Realtors all chasing the same 300 listings. Yet 97% of the market is “off market” or “pre-market” and is relatively untouched and ignored by Realtors. That’s your “blue ocean”. Because the “little Zillow” idea is a portal idea it now gives you access to the other 97% of the market – that’s 9,700 homes in a 10,000 home market. By catering to the off market homes you’re building a loyal client base and establishing yourself as a community leader and local authority. Your goal is to position yourself as a top local Realtor before a homeowner makes the decision to sell and before he or she hires a Realtor. It’s a long-term play but the pay off should be exceptional. If you’ve read a book called “Blue Ocean Strategy” you should understand that it’s much more profitable to swim in the “blue ocean” rather than compete on price or service in the highly competitive “red ocean”. In our scenario the red ocean is the space where 99% of Realtors compete for active listings, roughly 3% of the whole real estate market. The blue ocean is the 97% of off market listings that just about every Realtor ignores as they only want active buyers and sellers. The next element of the Little Zillow idea is that you need to create a local real estate portal. You need to add interesting and relevant local real estate content to the portal so as to primarily cater to homeowners. By creating a portal you’re giving local homeowners access to important local real estate information and you’re creating a vehicle to reach out and meet every prospect in your market. It’s a phenomenal vehicle to meet every homeowner before they decide to sell their home. The reason your website is a portal is because you will include the public data for every home in your area, you will cover all real estate issues and you will actively encourage related real estate service companies and local authorities to participate in your site. The obstacle is that it’s not easy to build a local real estate portal. In particular you need to 1) build a database and 2) publish the database. If you live in a large urban area this will mean allocating a lot of resources and man-hours building and publishing a database. I’ll show you a few short cuts later but the bottom line is that this is a serious time and money investment. But in this case the obstacle is actually the opportunity. That’s because if it were easy then someone in your area would have already done it. There’s a significant barrier to entry that will protect you from copycat competitors. So think of the obstacle as the opportunity! The final step is to create a membership area behind the real estate portal. Unlike the real estate portal the membership site is not wide open to the public and requires your approval for someone to join the site. The membership portal will be restricted to different types of members, namely homeowners, tenants and prospective buyers and will contain information about the local real estate market that you don’t want to share with the public. The key to the membership site is that it will create a restricted community that you control and can use to communicate with every member. The goal is to get every local homeowner and resident to join the membership site. You need to get local to join the site. In order to do that you need to make it worth their time. They way you make it worth their while is to give them access to relevant and interesting local real estate news and information. If you get this right you will get a return on your investment for the rest of your real estate career. You have a number of significant advantages over Zillow. In the following section I’m basically giving you the Blueprint to beat the snot out of Zillow in your local Market. (Maybe we should call this the Zillow Killer instead of the Little Zillow). Zillow is a national company that tries to cater to its audience by creating analytical and engineering solutions for local real estate. That’s an almost impossible task that tests and vexes their engineering team every single moment of every single day. It’s why their Zestimate stinks! Now please don’t interpret this as an anti-Zillow statement. I personally love Zillow and have a huge amount of respect for how they’ve build a phenomenal national real estate database. But their real strength is showing homes for sale. They parlayed this strength to attract a huge amount of visitors and became the most popular real estate website in the world. Their biggest weakness is the lack of real local insight into local real estate markets. 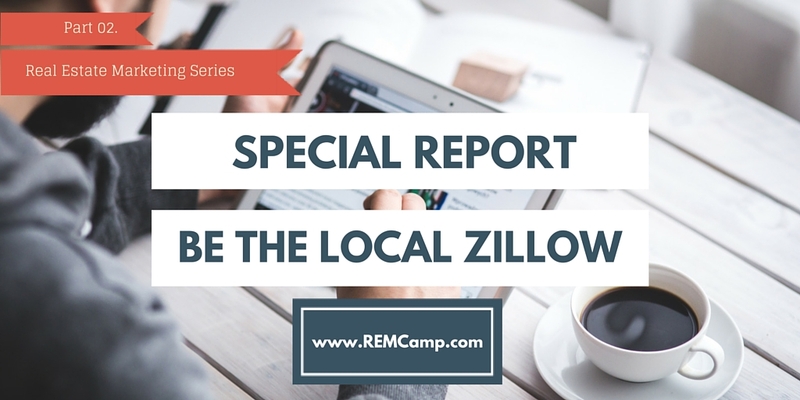 This is the area that you can completely dominate Zillow because your greatest strength is intimate local knowledge. Your second advantage is local real estate knowledge and working in the trenches selling real estate. While Zillow understands how to run a media company you understand how to sell real estate. Zillow is like a play-play agent while you’re the real wheeling dealing player. As soon as a buyer or seller contacts you it’s game over as you offer a real world experience and expertise that Zillow can never even come close to matching. You only need to understand your local market. Zillow tries to understand the national market and then makes the mistake of extending national analytics to local markets. They have an engineering first approach whereas you have boots on the ground and real raw data and expertise. Zillow can’t tell if a home is down wind of a pig farm or is a purple and red painted eyesore. All they see is beds, baths and square feet. Zillow sees the house – you see the home! The bottom line is that you’re a local expert and you’re committed to just your local area. There’s just no way Zillow can know your market like you know your market and it will never be profitable for them to hire local resources to compete with you. Isn’t it time to take back your town from the large real estate portals? Their advertising rates have sky rocketed and most Realtors are priced out of the market when it comes to buying leads from Zillow, Trulia and Realtor.com. Isn’t it time to build your own pipeline of affordable and quality buyer and seller leads, who already know and trust you, and want you to represent them as their real estate broker? If you like the blueprint I outlined to build your own Little Z, and you want me to help you build it, send an email to ross@remcamp.com and schedule a call.